Edit - I should note this was true w/ 4.4 as well - it's not due to 4.5 upgrade. C.
Update - I use Pilot2ATC - so to test today I connected my headphones directly to the P3D machine using P3D ATC w/ the same result. I also went into the SYSBoard - I tested if the software would recognize the COM2 button when assigning the Multicom under the Radio Assignments tab - that worked so the COM2 button is being seen. I also checked under the Input Assignments just to be sure - Radio TRF COM2 PUSHED gives you 'Jetmax Multicom:XXXXXXX 3 ON....the same you get for all assignments which makes sense as the unit would have been assigned in the other tab. Possible I'm expected it to work and it shouldn't - I looked up the unit on the Azure Air website and it says it's a dual channel unit - but I may be misinterpreting or it may have changed at some point. You can select to receive from both COM1 and COM2 in your FS default flight file. It worked in FSX but I have just looked at P3D v4.4 and the default flight files are .FXML which I have no idea how to edit. You may also have to check or uncheck something in SimA. There was a post from Mark on that, somewhere. The Sim-A Server takes command of the FS Audio Panel. You can assign offsets to these functions and setting the offset value to 0 or 1 will switch on/off the appropriate switch on the FS audio panel and the assiciated sound trigger. Therefore to hear the Marker sounds the MKR_VOL= value must = 1 to enable it on the FS audio panel. FS must transmit on either COM1 of COM2 so by default COM1 is active is the offset value assigned to VHF_TRANSMIT_2= is set to 1 then the transmit will switch to COM2. Setting this value to 0 will revert the transmit back to COM1. There was also a recent addition to the Sound Module to allow it to play the Morse Code identifiers. You can now turn the "NAVIGATION" sounds down in FS and the sound module will play the tuned navaid morse ident if the appropriate _VOL is set on the FS audio panel. This allows you to run a sound module on a seperate computer connected to your cockpit headphones and play morse code via the headphones rather than through the FS speakers. If you don't want to do any of theis there is also a checkbox on the Server Control Panel Tab "Use Internal I/O Radio Function". If this is deselected the Server will not write to the FS Audio Panel. Thank you - I was able to make the change - will need to be at home to test. I also will look into Jackpilot's suggestions. Keep us posted. Useful tip. This is beyond my skills so I have been referencing page 48 and 49 in the manual as well as Mark's post above to learn as much as I can. You will be able to tell where I am lost by the questions/comments below. I am not using Pilot2ATC for this test as it is networked from a third computer and its manual states that P2A COM 2 doesn't work w/ all software. So I am using ATC out of P3D and once I get COM 1 & 2 working I'll deal w/ P2A. Also, I have two computers - P3D on one machine and Sim-Avionics on another. Currently, if I have COM1 punched on my Multi Nav/Comm and I change frequencies in P3D my frequency in COM1 on the Multi Nav/Comm will change which tells me the two systems are talking w/ each other - but I am still unable to get COM 2 to go active. Under [FSUIPC_INPUTS] offset/value - see below - I'm definitely confused on 'where' to type in the offset and what value and/or offset to use. I believe this was already populated in the FSUIPC I/O Interface - and from Mark's post and page 49 it looks correct to me. Per Mark's post - "...to hear the Marker sounds the MKR_VOL= value must = 1 to enable it on the FS audio panel". All of the VOL= values are 1 and it has assigned offsets 5300 and 5301 to VHF_TRANSMIT _1/2. 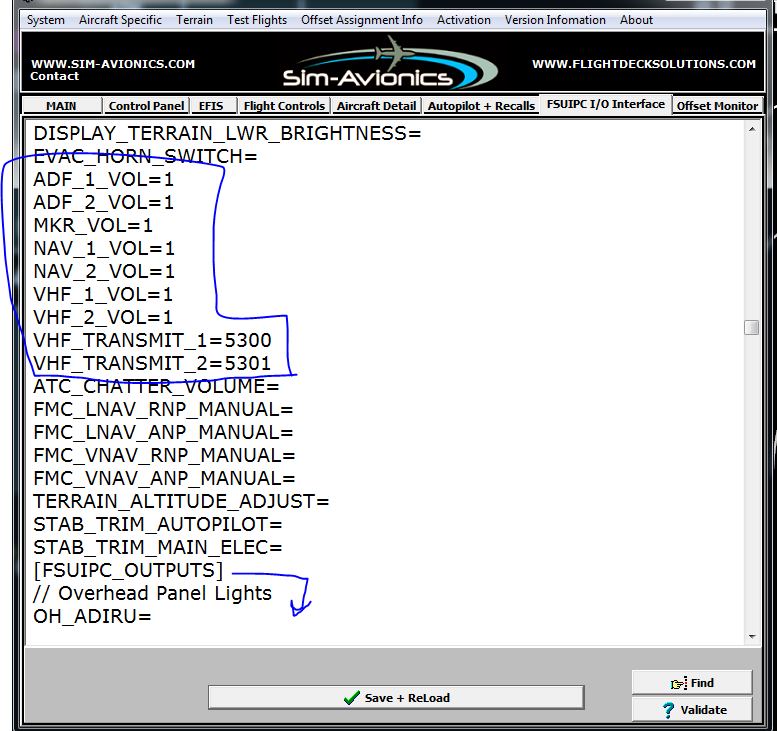 From page 48 of the manual "Tell your I/O software to write a value to a FSUIPC offset when a button is pressed and then assign that offset to a function in the Sim-Avionics Server." I believe the image below shows that VHF_TRANSMIT_1/2 are assigned the offsets 5300 and 5301. If correct, how do I tell the I/O software to write a value to those offsets? I tested by trying to assign the COM 2 button in the server Input Assignments tab by hitting COM 2 and Assign 1, but kept getting 'Select an Assignable Button First'. The same options for MKR_VOL through VHF Trasmit appear further down the list under [FSUIPC_OUTPUTS] in the FSUIPC I/O Interface tab - which for now I have done nothing which could be my issue. Is this where I need to assign a value for the offsets 5300 and 5301? Mark has a FSUIPC guide that digs further into the workings of the software - I'm off to it and do some more reading. Any help - as always - is greatly appreciated. C.